God's approach to old age is surprising! Here's how older Christians can lead more productive and rewarding lives. "Every day I pray that I will die!" The speaker was an elderly woman confined to a wheelchair. Life in an "old-folks' home" had become unbearable for her. She was lonely, bored and in poor health. Her old friends were dying one by one. Her family didn't visit anymore. She had no reason to go on living. Is it God's desire that older people waste away their final years of human life staring blankly at television screens? Are people of no value once they reach 65 or 55 or 45, or whatever age society sets as the age after which people are considered to be washed up? 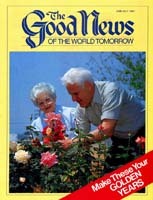 The answers, if more widely known, would bring comfort and hope to millions of senior citizens! Age has never been a problem for God. After all, who is older than the Eternal, the "Ancient of Days" (Daniel 7:9)? God's approach would surprise many in this youth-oriented society, where people with perfectly good skills and experience are often pushed into retirement. Many of God's people through out history were chosen for important tasks when they were of advanced age. For instance, Moses was 80 and Aaron was 83 when they were directed to lead Israel out of Egypt (Exodus 7:7). Abraham was 75 when God called him out of his country for a great purpose (Genesis 12:1-4). Noah certainly could claim senior citizenship — he was 600 years old when the Flood was upon the earth (Genesis 7:6). God still calls older people to playa vital role in His work, and each individual is placed there for an important reason, regardless of age or handicaps (I Corinthians 12:18). God tells us, "The silver-haired head is a crown of glory, if it is found in the way of righteousness" (Proverbs 16:31). Many dedicated Church members are in their 70s, 80s or 90s — a handful are more than 100 years of age. Why would God call or work with someone up in years? Precisely because of the person's years, in part, and the wisdom and experience those years have produced. As Titus 2:1-5 explains, older Christians have a tremendous capacity for teaching and setting right examples. Younger people, when was the last time you tapped the reservoir of experience that belongs to older men and women? I still remember many of the stories told to me by my grandmother, a former schoolteacher. As a small boy, I loved to go for walks with my grandfather, holding his strong, calloused hand, while he shared with me his many experiences as a blacksmith. God commands us to listen to the wisdom of our elders (Proverbs 23:22-23). Leviticus 19:32 commands, "You shall rise up before the gray headed and honor the presence of an old man, and fear your God: I am the Lord." When we visit the elderly, we should treat them with respect and profit from their wisdom. God will not tolerate dishonor (I Timothy 5:1). Failure to follow these principles can result in dire consequences. I Kings 12, for instance, tells the story of Solomon's son Rehoboam, who was faced with the difficult decision of whether to maintain the high taxes that had burdened the nation of Israel during his father's reign. At stake was the nation's loyalty (verses 3-4). After requesting three days to consider the matter, King Rehoboam first consulted with the old men who had served Solomon: "'How do you advise me to answer these people?' And they spoke to him, saying, 'If you will be a servant to these people today, and serve them, and answer them, and speak good words to them, then they will be your servants forever'" (verses 5-7). Rehoboam was not satisfied with the voice of experience, however. The advice of the young men, faulty though it was, was more to Rehoboam's liking: "Then the young men who had grown up with him spoke to him, saying, 'Thus you should speak to this people who have spoken to you, saying, "Your father made our yoke heavy, but you make it lighter on us" — thus you shall say to them: "My little finger shall be thicker than my father's waist! And now, whereas my father laid a heavy yoke on you, I will add to your yoke; my father chastised you with whips, but I will chastise you with scourges!"' So Jeroboam and all the people came to Rehoboam the third day, as the king directed, saying, 'Come back to me the third day.' Then the king answered the people roughly, and rejected the counsel which the elders had given him" (verses 8-13). The result was a civil war in which the nation of Israel split into two separate countries, with the larger being under the rule of Jeroboam (verses 19-20). It would have paid to heed the advice of the elderly. Is it God's will that we shut down once we reach a certain age? Should we ever stop learning and serving? The parable of the talents in Matthew 25 indicates that we should continue to grow in knowledge and character. God was highly displeased when the person with, admittedly, only one talent did not develop his full potential (Matthew 25:24-30). How can older people lead productive, rewarding and more secure lives? Here are four ways. 1) Take care financially. Proverbs 6:6-8 shows us the principle of saving, by the example of the ant that busily prepares for the winter months. In these difficult times, older people often have financial worries. Even the various social programs governments offer do not solve every problem. The U. S. Social Security fund, for example, seldom provides enough funds to cover all expenses. It was originally intended not to replace savings or family assistance, but as a supplement. Many older people are able to increase their income by selling their own handicrafts or by working at part-time jobs. When senior citizens are unable to provide for themselves, their families bear responsibility for caring for their needs: "But if any widow has children or grandchildren, let them first learn to show piety at home and to repay their parents; for this is good and acceptable before God.... But if anyone does not provide for his own, and especially for those of his household, he has denied the faith and is worse than an unbeliever" (I Timothy 5:4, 8). If the family is not able to provide, then God has instructed that the needy should be helped by means of the financial system God has set up within His Church (Deuteronomy 15:7-8, 10-11, 14:28-29, 26:12-15). 2) Guard your health. "Beloved, I pray that you may prosper in all things and be in health, just as your soul prospers," wrote the apostle John (III John 2). Taking care of one's health, if practiced over the years, will pay big dividends in later life. We should treat our bodies with care, because they are temples of God's Holy Spirit" (I Corinthians 6: 19-20). Taking care of one's health includes proper nutrition and exercise; avoiding bad habits such as smoking, excessive drinking and drug abuse; coping with stress and maintaining a balanced, happy frame of mind. Younger people should show special respect for those seniors who struggle with infirmities and pain. I remember one woman who, when offered assistance at a senior citizens' function, protested, "I am not a cripple!" She was handicapped, but wanted to retain as much self-respect and independence as possible. We should offer help in such cases, by all means, but not push it. We should also be acutely aware of seniors' personal sensitivities and treat older people with respect, outgoing concern and compassion. 3) Serve. Timothy formed in the Church a service group totally composed of widows more than 60 years of age (I Timothy 5:9). The main requirement for being part of this group was that each widow "trusts in God and continues in supplications and prayers night and day" (verse 5). Today, too, there is a real need for those who have time to pour out their hearts to God in beseeching prayer for His work and His people. If you are able to, why not send notes of encouragement to those who need a kind word, or invite to dinner a new family in the area? When was the last time you knitted a sweater for someone's baby or gave welcome pointers to a young fellow building his first home? There are always opportunities to serve for those who have the desire. Ask God to, according to His will, use you as a servant (Philippians 2:13). 4) Look to God. No amount of savings, good health or family assistance can replace God's help, which we all need to rely on foremost. In times of weakness, loneliness, want or pain, we all have a High Priest who understands our needs (Hebrews 4:14-16). It is powerful faith in this Redeemer, Jesus Christ, that will ultimately see everyone of us, young or old, through the storms of this life. "Thus says the Lord of hosts: 'Old men and old women shall again sit in the streets of Jerusalem, each one with his staff in his hand because of great age. The streets of the city shall be full of boys and girls playing in its streets.'" There will be no generation gap then, no thousands of elderly languishing away in rest homes, their lives filled with despair. Young and old will rejoice together at the blessings of God's rule (Jeremiah 31:12-13). If you know older people, and you surely do, remember the definition of pure religion: "Pure and undefiled religion before God and the Father is this: to visit orphans and widows in their trouble, and to keep oneself unspotted from the world" (James 1:27). Give the elderly your time, conversation, rides, letters and service — your godly love. If you do, the rewards will be great.